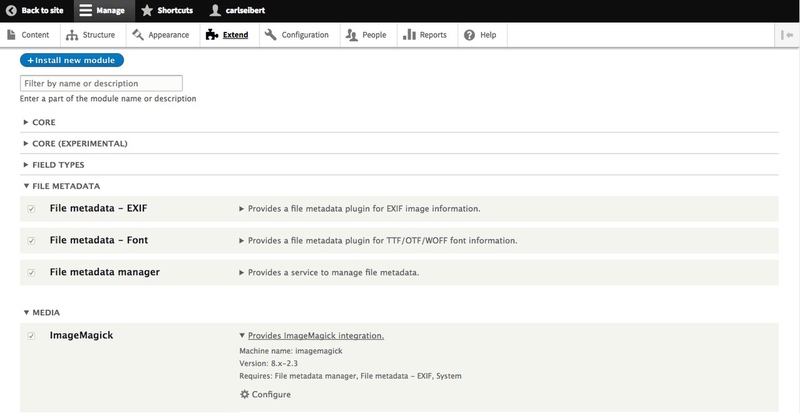 Switch to ImageMagick and Drupal will preserve metadata. So you run a website and you read my post about the Jessica Simpson lawsuit and destruction of copyright management information. Now you’re thinking about how not destroying metadata would help, well, everybody. True enough. You can protect your contributors, reduce pollution on the web, make assets easier to manage and, just maybe, prevent a nasty lawsuit by preserving metadata (and CMI). For Drupal and WordPress users, there’s a really simple solution: Make sure you are using ImageMagick instead of GD for your image manipulation library. Then you’re golden. Metadata (including copyright management information) that comes in on your contributors’ (or your own) images goes right out to the web, untouched. Drupal, for those unfamiliar, is the second most popular content management platform for websites, after WordPress. Drupal is generally geared toward large enterprise sites, like eBay, or Economist.com. WordPress users can learn about enabling ImageMagick for their CMS in this post And this one and, if your host just doesn’t offer it, there’s this one. Switching to ImageMagick will likely be helpful in other ways, besides preserving metadata. GD is not the most loved imaging library in the whole world. Its detractors say that it isn’t as flexible as ImageMagick, isn’t as powerful as ImageMagick, and that they achieve better image quality with ImageMagick. Some users claim a performance advantage for one or the other libraries, but in most cases, imaging libraries are only used sporadically, when new content is published. Unless you’re running eBay and dealing with a constant firehose of new content, it’s doubtful that you’ll notice any impact on your server with either. Out of the box, Drupal destroys metadata. Switch the GD imaging library to ImageMagick to solve the problem. (Just like in WordPress) This HOW-TO video takes us through making the switch in a jiffy. So then, the switch to ImageMagick sounds like it carries more upside than downside. Stand by for the HOW-TO. Go to the Admin pages of your Drupal site, and go to Configuration. On the Configuration page, go to Image Toolkit. On the Image Toolkit page, most likely, you will see “Select an image processing toolkit”, and only one radio button – for GD. If ImageMagick is not installed and activated, there is only a radio button – for GD. At this point, it’s probably a good idea to Google “Drupal-ImageMagick-your hosting provider” to see if there’s host-specific documentation for enabling Image Magick. If there is, we can proceed. If not, we need to determine if your host provides ImageMagick on its servers for your class of service. Most reputable Drupal hosts will. If Google fails to return an answer, a call to customer service might be necessary. My test Drupal instance lives in a sandbox at Pantheon. Pantheon’s ImageMagick documentation is here. On my test Drupal 8 system, all that was involved was adding a module or two and turning it/them on. I installed the module and it complained of an unmet dependency: “Requires: File_mdm (missing)File_mdm_exif (missing)System”. Oh dear. If I was a seasoned Drupal guy, I would probably have been able to decipher that all that was being asked of me was to add another module (and which one). But since I’m… me, a chat with Customer Service ensued. The rep with whom I chatted didn’t know the answer, so I shelved the project for about 5 hours until an email from Pantheon arrived with the straight scoop. As per my email from customer service, I grabbed https://www.drupal.org/project/File_mdm , which actually includes both of the dependencies. I installed it and activated both it and the ImageMagick module and things were good. These are the modules that I had to install on my instance of Drupal. The three ‘File Metadata’ modules actually come as one. You may find that you need to specify the path to the ImageMagick executable. I didn’t this time, but you might. Typically, on Linux/Unix systems, it’s /usr/bin/convert. “Convert” being the executable. It might be somewhere else on your server, of course. But on the ones that I’ve dealt with, /usr/bin is where it’s been. Once ImageMagick is up and available, go to Configuration > Image Toolkit, and you should now see two radio buttons, one for ImageMagick and one for GD. Choose ImageMagick. Now, you’ll see a section for ImageMagick settings. The defaults were fine for me. Check to make sure that ImageMagick rather than GraphicsMagick is selected. When ImageMagick is installed and available, there is a radio button to select it in Configuration > Image Toolkit. Now it’s time to test and see what we’ve accomplished. 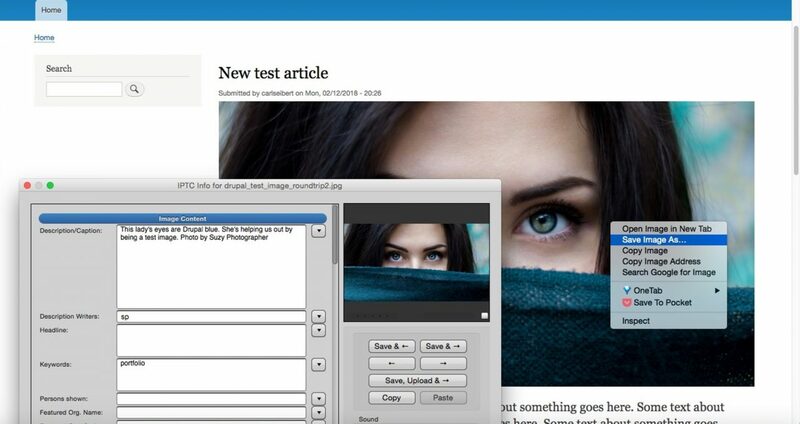 From the backend of your Drupal site, create a content item that includes a picture. Upload a test image that is bigger than the version that will be served on the page. And be sure it has metadata! Now view your content item and right-click on the picture and download it. Download a picture from your test article to see if metadata was preserved. If the metadata is there, as it should be, you’re in business. The metadata (including CMI) that you or your contributors put on your images will be safely embedded in your image files. If the pictures find themselves somewhere other than attached to your pages, they can phone home. Or the caring stranger who finds them can call for them. Several posts on this blog mention the impact – or lack thereof – of metadata on page load times. Try this one. And stay tuned for my upcoming in-depth look at optimizing images for the web. Had I known ahead of time about the additional module, this whole operation, including testing, would have taken less time than reading this post. As it was, it wasn’t exactly strenuous. Have you upgraded to ImageMagick? Did doing so make you feel better? Do your contributors express heartfelt gratitude? Does your dog appreciate you more? Jump in the comments and let us know.